The Stiftung Michael (or Michael Foundation) has awarded the Michael Prize 1999/2000 to two scientists who have applied advanced neuroimaging methods to clinical epilepsy research in an outstanding manner. At the same time the "Stiftung Michael" honours the successful work of the Epilepsy research Group, Institute of Neurology, London, inaugurated by John Duncan. The Michael Prize was presented at the 24th International Epilepsy Congress in Buenos Aires by the Congress President. The prize money of DM 20,000 was kindly donated by Novartis. 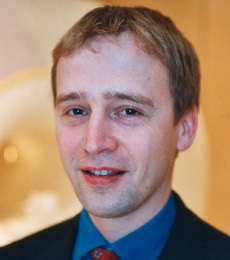 Matthias Koepp submitted four manuscripts to which he significantly contributed focussed on positron emission tomography (PET) in temporal lobe epilepsy and in other epileptogenic structures. The PET method allows for measuring the tissue concentrations of radioactively labelled substances in topographically distinct cerebral structures. Investigations are possible at rest, as well as during functional activation and seizure activity. The interest lies in the localisation and pharmacokinetics of receptors, particularly opiate receptors (11C-diprenoprhin) and central benzodiazepine receptors (11C-flumazenil). The work presented aims to identify in-vivo abnormalities of neurotransmitters and receptors in localisation-related epilepsies (hippocampal sclerosis, temporal lobe epilepsy with normal MRI, malformations of cortical development and extra-temporal lobe epilepsies with normal MRI). In particular, both clinically and significantly important are the findings of widespread temporal and extra-temporal receptor abnormalities in patients with quantitatively and qualitatively normal high resolution MRI, as they suggest neurochemical and functional abnormalities in normal appearing morphological structures. Dr. med. Friedrich Woermann, submitted four manuscripts to which he significantly contributed focussed on magnetic resonance imaging (MRI) and spectroscopy (MRS) in temporal lobe epilepsy and juvenile myoclonic epilepsy. The approach of MRI complemented by techniques measuring metabolism, blood flow and chemistry of neuronal function of the brain, constitutes a great advance in the in-vivo diagnostics of people with epilepsy. Whilst MRI is able to visualise and quantify atrophies, dysplasias and sclerosis, MRS can identify metabolic abnormalities. Using these techniques, changes in the metabolic profile could be identified in temporal lobe epilepsy with normal morphological structure. In the work submitted, the methods of MRI and MRS were scientifically evaluated and their value in clinical diagnosis and research convincingly presented.